Virginia’s House of Delegates has taken the first step toward awarding the state’s electoral votes proportionally, rather than via the current winner-take-all system. The move would make Virginia the third state, along with Maine and Nebraska, to allocate Electoral College votes by giving one to the winner of each congressional district and two to the statewide winner. The change, which was approved by a House subcommittee, still needs to pass the entire House. And even if that happens, it would face strong opposition from Democratic Gov. Terry McAuliffe and the state Senate, where an identical bill failed to make it through committee. But this isn’t the first time Republicans in Virginia and other states have raised the possibility of moving away from winner-take-all allocation. How much of an advantage could Republicans gain in presidential elections by moving states to a system that distributes electoral votes based on the number of congressional districts each candidate wins? We can check by using Daily Kos Elections’ newly released data that breaks down presidential vote by congressional district. The main takeaway: In an Electoral College in which every state awards its votes by congressional district, Hillary Clinton could have won the national popular vote by 5 percentage points and still lost the White House. Simply put, the way the country’s congressional districts are drawn maximizes Republican votes. Clinton won the national popular vote by 2 percentage points, but she won only 205 congressional districts, compared to 230 for Trump.1 The median electoral vote (or tipping point state) in the current system was in Wisconsin, which Trump won by less than a percentage point. Trump won the median congressional district, meanwhile, by 3.4 percentage points. But it’s not just that more congressional districts lean Republican than lean Democratic. Rather, many districts lean a lot more Republican. Clinton would actually have won a few more electoral votes in 2016 had all states used proportional allocation by district (though she’d still fall short of 270). For the most part, the current system actually gives the GOP a bigger advantage than using congressional districts would. (And both are more favorable to Republicans than simply using the national popular vote.) That changes, however, when the national popular vote favors Democrats by 2 to 3 percentage points. Clinton likely would have won the Electoral College in 2016 had she won by 3 points nationally using our current system, but not if every state awarded votes by congressional district. Indeed, even shifting every district an additional 3 percentage points toward Clinton (to allow her to win by 5 percentage points nationally) would not have been enough for her to win under a congressional-district-based system. In this scenario, Clinton would have won an additional eight electoral votes from winning a plurality in four states (Florida, Michigan, Pennsylvania and Wisconsin) and an additional 12 electoral votes from winning 12 more congressional districts. That would leave her with 268 electoral votes. Under the current system, she’d win 307 electoral votes if she won the national popular vote by 5 points. Virginia is a perfect example of how using congressional districts penalizes Democrats. It has gone blue in the last three presidential elections. Hillary Clinton won it by 5 percentage points, carrying all 13 of its electoral votes, and former President Barack Obama won it in both 2008 and 2012. But Clinton won only five of the state’s 11 congressional districts in 2016. A combination of urban packing and gerrymandering by Virginia’s GOP legislature means Republicans have an easier time winning a majority of congressional districts than a majority of the vote. Under the proposed rule changes, Clinton would have been awarded just seven of the state’s 13 electoral votes. So Clinton would have lost six electoral votes, which wouldn’t have made a difference in 2016. But six votes is nothing to sneeze at. Let’s say Michigan, Pennsylvania and Wisconsin, which all went for Trump by a hair in 2016, instead went to Clinton. And let’s say Trump carried New Hampshire. That was a feasible map in which Clinton would have won the Electoral College with 274 electoral votes. But if Virginia allocated its electoral votes proportionally, Clinton would have won only 268 electoral votes — Trump would have taken 270 electoral votes and the White House. If what Republicans are trying to do in Virginia sounds familiar, it should. Some Republicans in the Minnesota and New Hampshire legislatures want to do the same thing. And after the 2012 election, Republicans pushed similar proposals in Virginia, Michigan, Pennsylvania and Wisconsin. But GOP legislators should be careful not to overestimate the consistency of American politics. The 2016 election should have made that clear. If every state awarded electoral votes by congressional district, Republicans would gain a clear advantage, but changing the rules piecemeal is more dangerous. Had Michigan, Pennsylvania and Wisconsin’s legislatures acted after 2012, they would have cost Trump electoral votes in 2016. 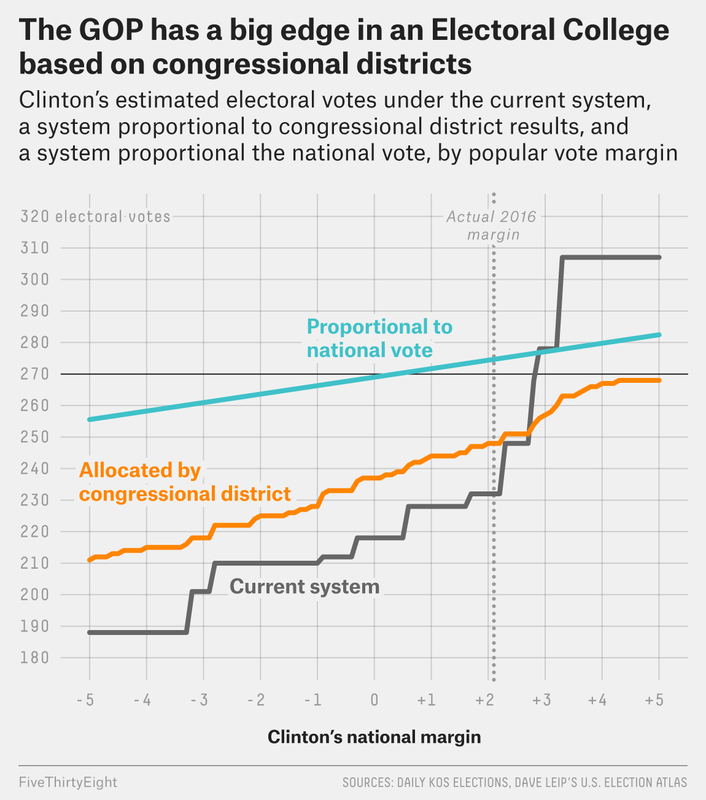 If those three states had changed to proportional allocation by congressional district, Clinton would have won an additional 13 electoral votes by carrying 13 congressional districts in those three states. That would have left her with 245 electoral votes. But imagine if the election had been slightly closer and Clinton won the two states (Michigan and Pennsylvania) that went for Trump by the smallest margin. Under the current system, Trump still would have won exactly 270 electoral votes to Clinton’s 268. Clinton, however, got more votes than Trump in two congressional districts in Wisconsin. If Wisconsin had changed its allocation system like Virginia is trying to do, Clinton would have won 270 electoral votes and the White House. There’s just no way of knowing which party is going to win what states in the 2020 presidential election. Changing the way Virginia allocates its electoral votes this year could help the Republican nominee for president in 2020. It could also backfire if the parties’ coalitions change, like they did between 2012 and 2016. 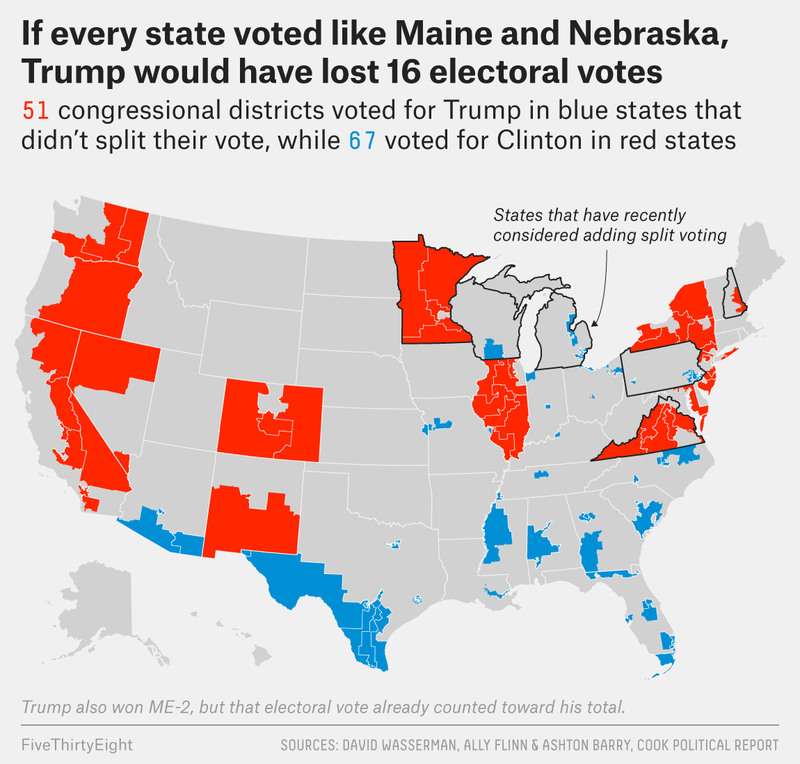 If, however, Republicans made a more concerted push to change the whole country’s Electoral College allocation rules to use congressional districts, it would make it very hard for Democrats to win the White House. Keep in mind that each congressional district is supposed to contain approximately the same number of people. Note we’re assuming no faithless electors.